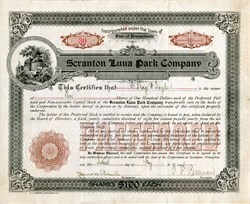 Beautiful RARE certificate from the Scranton Luna Park Company issued in 1906. This historic has an ornate border around it with a vignette of beehives. This item has the signatures of the Company's President, Major Thomas Penman and Secretary. The Scranton Luna Park Company was formally organized on March 15, 1906, with Major Thomas Penman as president. Penman also served on the Board of Directors of the Laurel Line, the Dunmore branch of which formed the eastern boundary of the park. Luna Park was an amusement park in Scranton, Pennsylvania, USA, from 1906 to 1916. Constructed and owned by Frederick Ingersoll, the park occupied a hilly site and included roller coasters, picnic pavilions, carousels, a fun house, a roller rink, a concert shell, a dance hall, bumper cars, and a shoot-the-chutes ride. A trolley park constructed in Scranton's Linwood Park (after a site in nearby Valley View Park was considered and rejected), Luna Park followed the formula that characterized Ingersoll's parks with that name (the first two, in Pittsburgh and Cleveland, were opened only a year earlier, in 1905) as Ingersoll designed and built all of them to form the world's first amusement park chain. Early promotional materials stated that the park would feature 50,000 electric lights, the same number as in Cleveland's Luna Park. A broadside announcing a May 21, 1906, opening of the park promised "unexcelled facilities for summer outings and picnic parties," that the park would present "a dazzling picture of quaint and massive architecture," and the picnic grove would have "quaint bridges, shady paths, and quiet nooks." The grand opening was delayed until May 28, 1906; the total cost of construction was $300,000 (US). Ingersoll had planned on the Scranton Railway Company extending its service (and its tracks) to the park, but the company refused to build the one-third mile of track to connect the entrance of Luna Park to the picnic grounds at Nay Aug Park, forcing Ingersoll to construct and light an access road at the cost of $800, At the same time, the railway company constructed a subway under the park, opening a station at the cost of $7000 (US) despite the preference of the park patrons for streetcars. Ingersoll had also overestimated the first-year attendance at Luna Park, anticipating 500,000 paid customers in its maiden year, but the actual total was closer to 325,000 in 1906. Attendance declined in 1907, contrary to the anticipation of both Ingersoll and Scranton city officials. The cost of upgrading and maintaining his amusement parks proved too much for Ingersoll as he was forced to declare bankruptcy in 1908. 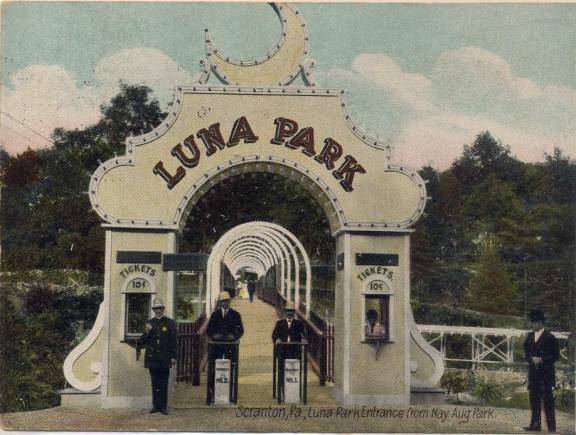 Several of the Luna Parks were sold to others; Ingersoll retained ownership of the Scranton park despite repeated attempts at collection by his various creditors. Attendance continued to decline to the point that Luna Park became unprofitable in the 1910s; a fire on August 23, 1916, destroyed the dance pavilion, roller coaster station, and runway of the "Shoot-the-Chutes", a significant portion of the park, a fatal blow to the struggling enterprise. Very few remnants of Luna Park remain after the construction of Interstate 81 through much of the grounds in the 1960s and a widening of the freeway in 1998.